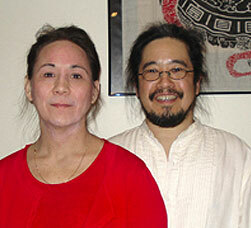 Clarence and Judy were married in 2006, joined their individual practices, realized their shared dream, and opened the doors of The Acupuncture Office in 2008. Dr. Clarence Lu, L. Ac. I always wanted to be a doctor. That’s pretty normal when your father was a long-time physician in Schenectady. Growing up, I was the stereotypical Chinese kid who wasn’t good at sports but was good at school, especially math and science. Then came the early 1970’s when I started to study Kung Fu, Tai Chi and meditation, which started my life on its present trajectory. Since my father was an MD, I was familiar only with pharmaceuticals and the only Chinese medicine I knew of was Tiger Balm, which is good for mosquito bites! I grew up taking antihistamines, antibiotics and getting allergy shots. Just before I started college, I lived with a real Kung Fu master who was also an accomplished traditional Chinese doctor specializing in orthopedics. He didn’t use x-rays, plaster casts or surgery, but used traditional Chinese herbs, liniments, set broken bones by feel and medical qigong. People who hobbled in on crutches would leave his apartment after a few weeks walking without a cane. That was my first exposure to real Chinese medicine. When I returned to Union College in 1982 after a year of study at Peking University in China, I planned to combine my pre-med background with my interest in Chinese medicine by doing research on Chinese herbs. Instead, I went to Yale University where I studied traditional Chinese philosophy and history and received an M.A. I travelled through China and Tibet for a number of years exploring the country and its traditions. Settling in NYC, I returned to my pursuit of Tai Chi and Qigong, which I taught, authored numerous magazine articles and served as a judge at local and national tournaments. Finally, I had an epiphany and realized that all my interests and formal schooling were dovetailing in the same direction – Chinese Medicine. I received an M.S. from the Pacific College of Oriental Medicine (NYC campus), the nation’s most prestigious school for acupuncture and Chinese medicine after four years of full-time study. I was also a faculty member there for five years where I taught the philosophical foundations on which Chinese medicine is based. I have also lectured at the New York Institute for Traditional Chinese Medicine, The China Institute in America as well as to medical students. Since returning to the Capital District, I have devoted myself to healing people. I wanted to be a doctor to help people, not just talk or write about it! Real world practice has taught me that people’s health is complicated and often far from clear-cut. The people with the most difficult, puzzling and perplexing health conditions have taught me that there is no “one size fits all” for anything, including medicine. To that end, I have studied numerous styles of acupuncture and bodywork, Clinical Nutrition, Applied Kinesiology, concepts in homeopathy and for the past five years, the Yintang Healing System with Dr. Ken Andes. I love it when a person’s pain and suffering is relieved; when a person can return to a normal life; when a person has regained their physical, mental and even spiritual sense of well-being. Helping people regain their health is my passion. It is who I am. Judy Kodela, B.S., L. Ac. I cannot imagine having a more rewarding occupation. When a patient’s pain or other complaint relieves by the end of a treatment – when they no longer need a medication, or when their long-term conditions resolve in the course of months – I feel happy for the patient. If patients are dealing with pain or lengthy health problems, I understand that they don’t just want relief for a short time. They want to “feel like themselves again.” I know that Acupuncture and Chinese Medicine can make this happen as I’ve observed in many of my patients, and in myself. My interest in Chinese Medicine began with my studies in Tai Chi and Qigong in 1992. Qigong definitely sparked my interest and I furthered my intensives studies and practice. My non-conventional view on health and the body’s potential to heal took on a new, practical aspect as I learned, practiced, and eventually taught these ancient arts. This background formed the basis of my Acupuncture training, and my own healthcare, and is now an integrated part of my Acupuncture practice. My certification with the National Certification Commission of Acupuncture and Oriental Medicine (NCCAOM) requires 60 hours of continuing education every 4 years. In addition to this, I have trained extensively with Dr. Ken Andes for the last 5 years, learning his exceptional system of assessment and treatment (Yintang Healing System) that brings a new and advanced level to Chinese Medicine. This system now enables me to treat acute and chronic conditions faster and more effectively, and I look forward to helping you gain that benefit!